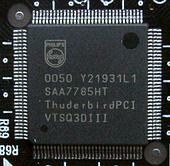 At the end of 1999 Philips purchased VLSI - the company which produced at that time progressive 4-channel ThunderBird 128 PCI chip supporting QSound, EAX 1.0 and A3D 1.0. Soon after this deal they released a new 6-channel Philips ThunderBird Avenger sound chip which supported a great number of algorithms of QSound, EAX 1.0, EAX 2.0/I3DL2 and A3D 1.0. 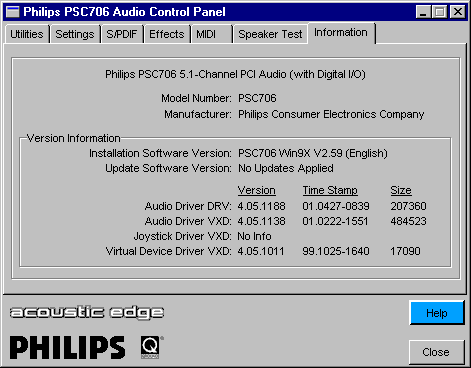 In 2000 Philips announced its own line of sound cards for the American market: 2-channel Rhythmic Edge (PSC702), 4-channel Seismic Edge (PSC704) on the old ThunderBird Q3D chip and 6-channel Acoustic Edge (PSC706) on the new ThunderBird Avenger. 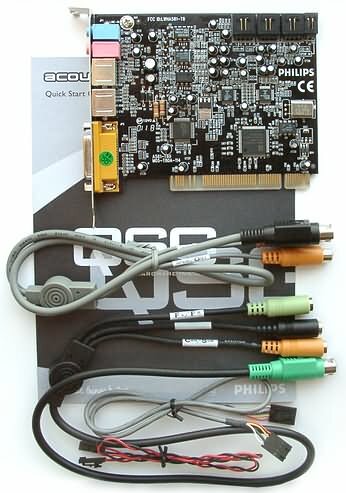 An updated line of sound card also base on new ThunderBird Avenger DSP was delivered to Europe in 2001. 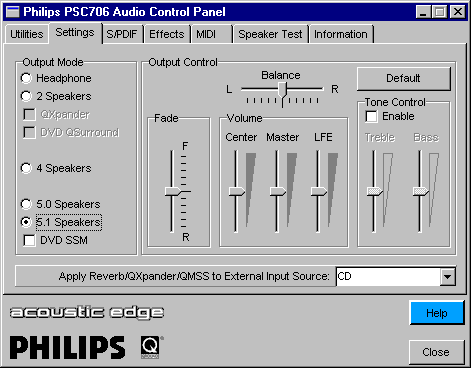 Rhythmic Edge (PSC703) became 4-channel, and the Seismic Edge (PSC705) turned into 6-channel. So if you interesting in Philips sound cards always draw attention to the model number! The latter two cards from Philips were examined in the Seismic Edge and Rhythmic Edge Sound Cards article. The 6-channel Acoustic Edge (PSC706) which is going to be tested today has an S/PDIF-In, a separate S/PDIF-Out and a program DVD-player in the retail version, contrary to the 6-channel Seismic Edge (PSC705). The OEM version of the Acoustic Edge is somewhere between the Live! 5.1 and the Audigy in price. Creative presses its competitors by cutting its prices, however the Acoustic Edge can interest users with its capabilities that neither Live! 5.1 nor Audigy possess. Digital S/PDIF-OUTs: external RCA-out (!). DVD QSurround - 5.1-speaker virtualization via 2 (DVD player support required). ThunderBird Avenger is a real hardware audio accelerator. Usage of CPU is minimal at the expense of hardware computation in the DSP: sampling frequency conversion, panning, mixing, virtualization, filtering, music synthesis, multichannel conversions and game-port support. Yamaha's certificate with the serial number for the XG MIDI S-YXG50 soft synthesizer. The advantage of the OEM version for a user is that he/she can save on such unnecessary things as a printed manual in all languages and a CD with demos of games or musical programs. QSound AudioPix Free program for creation of mpg files from mp3 files + images. While the 703th and 705th cards have the same design, the 706th one is a little different: there are two S/PDIF-INs. The plastic-shielded connectors are metallized inside. On the one hand, it complies with the PC99 standard concerning the color marking, and on the other hand, the connector has a large contact area and higher durability. As usual, there are three analog connectors: AUX-in, TAD, CD-in. The 6-channel Seismic Edge (PSC705) has a digital-out combined with a center/sub output, like in the Live! 5.1 and Santa Cruz. However, such solution doesn't suit everybody. An ordinary receiver with 6 analog-ins and a digital S/PDIF brings in an alternative: you can connect the card in a digital mode and improve stereo (but you lose multichannel support) or to connect in an analog mode to the receiver (but the quality won't be the highest possible for this part). 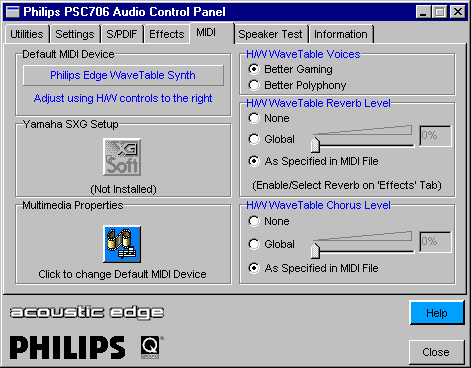 To avoid such problems you should get the most expensive 6-channel model of Philips - Acoustic Edge (PSC706), as it is the only card which has separate connectors for digital and analog modes. Unfortunately, even the most advanced model, Acoustic Edge, do not support chip's capability to use Inter-IC (I2S) audio bus. With it, you could have connected a 6-channel 24-bit/96kHz Philips UDA1328T DAC or something of higher quality instead of boring 18-bit/48kHz Sigmatel STAC9708T and STAC9721T. 24/96 DACs on the I2S bus usually have higher-quality converters than those used in AC'97 codecs. It is proven by the tests carried out in 16-bit 44.1 kHz mode with the RMAA program. And if the difference between cheap and expensive converters is not discernible on a computer acoustic system priced at $50, it becomes surprisingly noticeable in $30 headphones. I don't mean the Audigy card which apart from 100 dB of the SNR of the DAC has nothing to be proud of even in comparison with usual cards (see Hoontech SoundTrack Audio DSP24 Value Sound Card). The Audigy is a leader on the multimedia sound card market, but not thanks to the genius of Creative engineers but thanks to a competent marketing policy and lack of strong competitors. The S/PDIF interface supports 32, 44.1 and 48 kHz sampling frequencies, though the bit capacity can reach only 24 bits. S/PDIF-out supports an AC3 digital stream carrying data, thus, providing output of a DolbyDigital5.1/DTS coded signal onto the receiver. The S/PDIF-ins operate due to the Philips TDA1315H receiver/transmitter which has a TTL-level and highly sensitive inputs. Because of the specific input and output it's better to turn off the power when connecting external digital devices. The operational amplifiers have striking dimensions on all three channels. These Philips's NE5532N models have quite good characteristics. According to the specification, they are high-quality devices used for professional and measuring equipment and for matching with headphones. It's impossible to bear volume higher than 20% on the Philips HP600 headphones, while 90%/90% Master/Wave is considered normal on other cards. 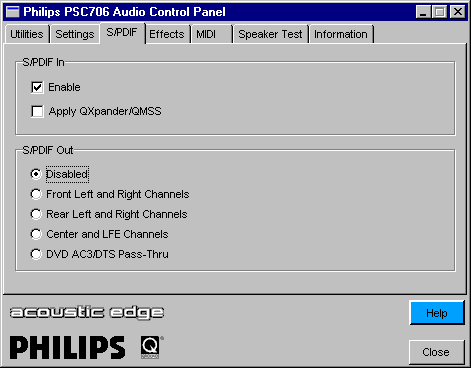 The Philips PSC706 Audio Control Panel utility is created to control card's modes. The system tray has an icon to enter this panel. 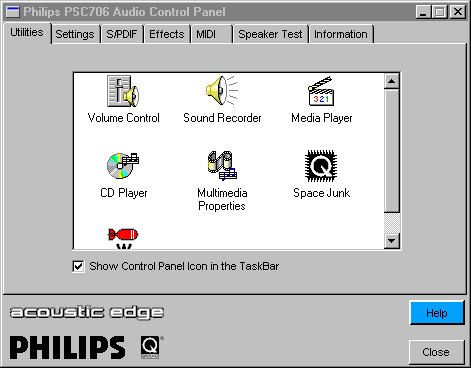 There is nothing interesting in the first tab: standard Windows utilities and 2 QSound demo programs. QSound Multi Speaker System for 4- or 5.1-speaker stereo reproduction. On the right is a volume balance control for the channels and a 2-band tone control. Below you can choose an external source of a signal for application of QSound effects. The third tab has settings for digital-ins. The next one allows choosing a type and a level of reverb effects. Checking of correctness of the channel connection. And the last is a tab containing versions of the driver libraries. As the Acoustic Edge (PSC706) card has a different layout of the PCB it was interesting to compare the results of the PSC703 and PSC705 obtained in the Seismic Edge and Rhythmic Edge Sound Cards Review. The tests were carried out with the RMAA 3.3 program and the results were collated with the professional sound card EGO·SYS Waveterminal 2496 which has the AKM 4524 codec. This test demonstrates quality of playback of audio CD and MP3 files. No changes as compared with the last tests. Despite the Average result of intermodulation distortions their character is quite pleasant. 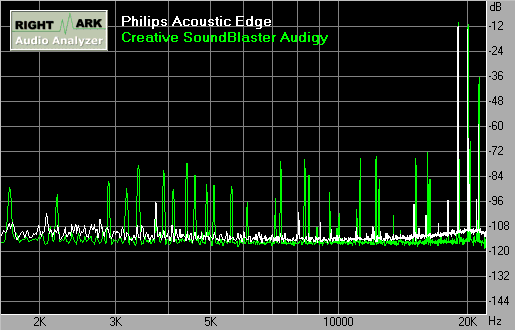 Let's compare spectrograms of this test for the Philips AE and SB Audigy (0.1% vs 1%). Lack of a forest of harmonics for the Philips implies a higher-quality algorithm of conversion from 44.1 kHz to 48 kHz. However, in low frequencies the situation is much better, just check the THD graphs of both cards. The mode of 48 kHz is used for watching DVD and MPEG4. The THD and IMD results are quite good, unlike the noise level which could have been smoother. Just look yourselves. The operating mode is the same (16bit 48 kHz) and the figures differ. The problem consists not in an absolute noise level but primarily in its coloration. That is, instead of monotonous hissing sound cards usually produce mid-range cracking which hides all details of the original sound. They are not pickups from video cards and other devices which are the problem. I have a professional card in the next slot without any shielding but just with high-quality converters; and it doesn't buzz. 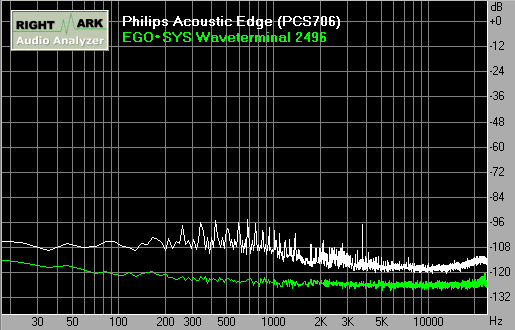 What we are mostly interested in in the Acoustic Edge (PSC706) card is its digital coaxial input and output. The results are brilliant! If you remember, S/PDIF stands for Sony / Philips Digital Interface Format. 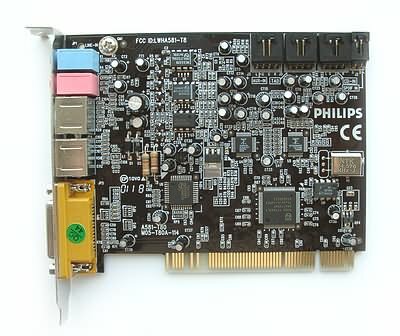 Excellent quality can be obtained if you take an external DAC or a receiver, connect it to your computer with the Philips card. If your have a MD deck with an electrical input (RCA), the Acoustic Edge will be an excellent source of a digital sound. (MD devices with optical systems can be used with CMI8738 based models, for example, Nightingale PRO 6 from Zoltrix). We wrote much on the quality in the Seismic Edge and Rhythmic Sound Edge Cards Review (including tests on active wooden speakers and headphones using CDs and MP3 files). 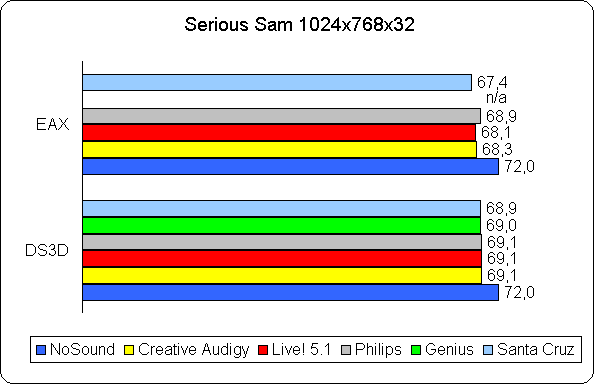 We compared 3 cards of the same class - Philips Edge (Philips SSA7785, SigmaTel STAC9708), Creative SB Live! Player 5.1 (Creative EMU10K, SigmaTel STAC9708) and Turtle Beach Santa Cruz (Cirrus Logic/Crystal Semiconductor CS4630, CS4294). The EGO·SYS Waveterminal 2496 professional card with the AKM AK4524 codec was a reference one. The conclusion is that MP3 and CD-DA are played equally well by all the cards. Quality in games is defined by algorithms of DS/DS3D streams mixing and by reverb quality. Digital sound often loses in quality when several audio tracks of the initial format are mixed. More than 3 sounds played simultaneously without special measures taken form just a mess. There are several factors that influence mixing of audio tracks: initial quality of samples, equalization of tracks and some additional operations. Audio data are to be converted into the higher bit capacity (32, 48); and then it's necessary to use high-quality mixing algorithms with the further downsampling using dithering and compression of the dynamic range. If we add reverb and 3D effects (positioning of sources) the calculation can take several hours even on a powerful processor. It means that there is no room for a real time mode. It doesn't suit games. Moreover, the delay of sound in games mustn't be over 100 ms, otherwise it will worsen perception very much. In practice, the delay of sound streams of 16bit 44.1 kHz mode on multimedia cards with the hardware support of DirectSound/DirectSound3D is tens of ms, and hundreds of ms in case of the program emulation. But remember that apart from mixing the sound engine has a lot other things to do. In most cases we get a mess of sounds with loud echo. On the other hand, initial quality of samples is far not the best in games. We often get overcompressed audio data with noticeable distortions of 16bit at 22 or even 11 kHz of sampling frequency. But all non-standard (different from 16bit 44.1 kHz) data flows are to be equalized before mixing, for what we have SRC (sample rate conversion) algorithms. Their quality plays a great role. It's not difficult to make a high-quality algorithm, the problem consists in limited DSP computational resources on the sound card and requirements of acceptable sound delay. In this respect, the leaders are Creative Live!/Live!5.1/Audigy cards. The 32 bit internal data format and 8-point frequency interpolation allow for highly discernible sound without loss of highs. Then we have CS4630 based cards - Santa Cruz, Hercules GT XP/6.1 with 24-bit internal data representation. The Philips family is at the same level. The worst quality in this respect is found on weak HSP chips which often use program DirectSound algorithms. We will omit algorithms of positioning of sound sources and environment presents (dynamic reverb). Unfortunately, current development of API positioning and reverberation took the wrong way of competing native APIs. Sensaura tries its MacroFX extension and non-standard extensions like ZoomFX. In response, Creative promoted its EAX 3.0 aka EAX AdvanceHD which is currently supported by just the Audigy card. It means that there will probably be no games at all or the support will hardly be appropriate. The Philips cards support all necessary APIs - EAX1.0/2.0 and I3DL2. Quality of reverberation of the QSound Environmental Modeling engine is rather acceptable. I liked more the sound without EAX as it was clearer and sharper. But tastes differ, as you know. I'd even give all 3D sounds for high quality of samples, eliminated SRC and high-quality mixing of channels. The best for positioning in the multi-speaker configuration is DS3D panning. The Sensaura is the best choice for 2 speakers and headphones. 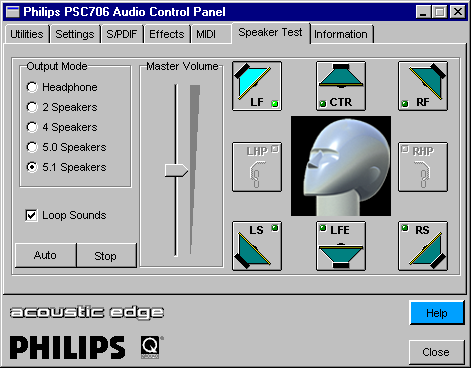 The QSound3Dinteractive engine is good as well, especially its hardware realization on the Philips cards. But do not estimate quality of QSound algorithms on the FM801AU chip which are deprived of the EAX support in the drivers. We found no bugs in the current drivers under the W98SE from the company's site. The measurements of fps in the Serious Sam were carried out on the Athlon 1200 / 512 PC133 / GF3 Ti200 testbed. The performance difference between different sound cards on a modern PC in playable resolutions isn't even worth mentioning. The greatest bottleneck is the sound engine. The difference with the sound on and off for different resolutions varies from 4% in 1024x768x32 to 6% in 640x480x16. And the difference in fps for different sound cards is within 1%. We made some attempts to check the processor utilization in the ZD Audio Winbench 99 but it showed 0% in all modes. 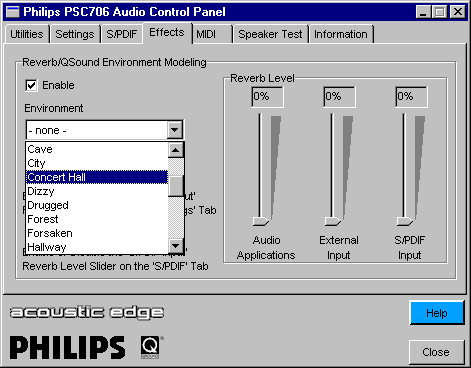 The Acoustic Edge (PSC706) sound card from Philips is a modern and inexpensive multichannel audio solution. The card made a positive impression on us and we recommend it for a wide circle of users. High-quality digital input and output with a standard RCA connector. Lack of a program DVD player (in the OEM version).